Leather sofas are a very pricey investment, but it is also an investment that should be taken care of regularly, if you want to make it worth its while. If you have bought a leather sofa but have forgotten to take into account its cleaning and maintenance, you do not have to panic. Call our company now and hire our professional leather sofa cleaning service for help. 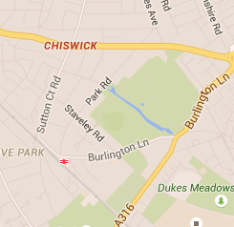 We are a cleaning services contractor and we operate here in W4 Chiswick. We are offering you a very efficient and fairly priced leather sofa cleaning service. You will not be sorry, if you choose us, we promise. Our cleaners are the best experts in their field and they have what it takes to prove it to you. Call us and see for yourself. There is a huge difference between professional and unprofessional cleaning. Many people choose to clean their leather sofas on their own, but they end up damaging them. Because the different types of leather require different cleaning approaches and products. 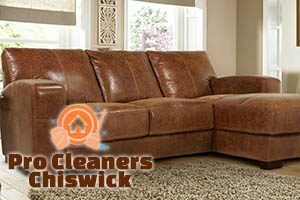 And if you lack the knowledge, products or skills necessary for a safe and proper leather sofa cleaning, you should hire professionals to do it for you. Our cleaners work using efficient leather cleaning products, they have different kinds of products for the different types of leather. And all of our cleaning products are safe for your furniture, we guarantee it. Our cleaners use cleaning products that will clean and also moisturise your leather sofa, preventing problems such as drying or cracking. 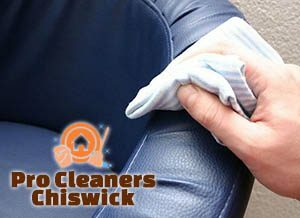 If you are looking for a competent and reliable leather sofa cleaning service in W4 London, call us right away. We will make sure your leather sofa lasts a very long time.